Using a 3/32" hex wrench, unthread the setscrew attaching the lever handle to the valve stem. Lift off the handle and cap. 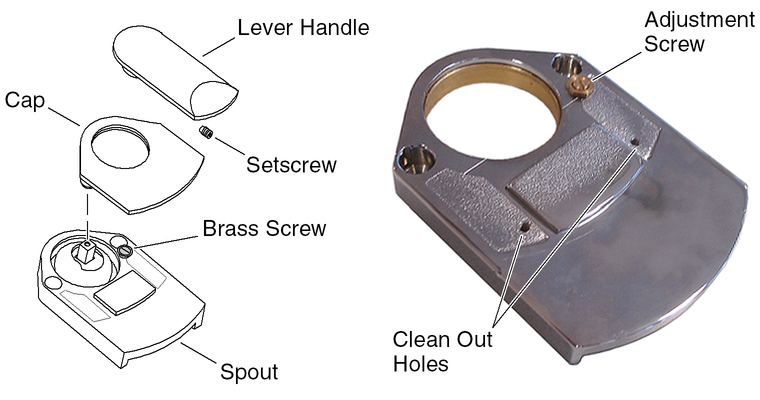 After the handle and cap are removed, a small brass screw will be visible. Using a bladed screwdriver, turn the adjustment screw to increase or decrease the flow of the water. NOTE: There are two small holes inside the spout that supply the water. If water flow is weak, they may be clogged with debris. Clean the holes for optimal flow.